Lucy Meck attended the Shop Wear Care event at Claridge’s hotel in London on Monday night. Lucy wore a Jean-Pierre Braganza Camel coat over her shoulders which she styled with a matching pencil skirt. She tucked in a white shirt from Belle Epogue with the sleeves rolled up into her brown skirt. With this outfit, Lucy wore a pair of strappy snakeskin cage heels from Office. 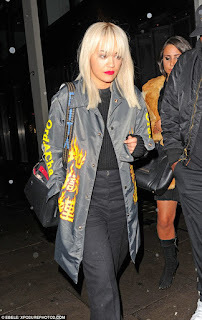 This week in London, Rita ora wore a grey jacket layered underneath black cropped trousers. The grey jacket has Chinese symbols printed on which was worn over a black cropped knitted jumper. Rita went 70’s with her cropped trousers and black chunky lace up boots. To accessorize Rita grabbed her leather satchel. Natalie Dormer has been a favourite of mine this week as she wore a stunning gown designed by Vivienne westwood and only for her when she attended the Mockingjay Part 2 Premiere. I can’t get over how amazing Natalie looks in this Lilac floral embroided dress. Wow nice dress,Thanks for sharing your post!!! !